← AC Upgrade Part 1 Results – 24 % Better! Looks like it’s finally time to re-level the yurt platform. To be honest, I’ve never slept as well in my yurt as I did in my house, which was on a slab foundation. I had a really nice $900+ Serta queen-sized mattress in my palatial master suite with its built-in hot tub. Moving into the yurt coincided with getting a 5″ memory foam mattress. The cargo bed also has no boxspring, so the foam mattress sits directly on its hard OSB frame. The AC setup, while rapidly improving, is still more intrusive in the yurt. It’s right next to the bed and blows the cold air directly over my feet. Finally, the yurt wiggles just a little bit on its platform, so there’s a small feeling of wobbliness to sleeping that took some getting used to. I went to bed after a pretty long and exhausting day, but didn’t feel very happy there. I remembered that my old sleeping setup was dangerous *because* of how amazingly comfortable it was. As soon as I would lie down, I would feel snuggly and sleepy and would have to fight to stay awake.The yurt bed didn’t feel that way, especially recently. I think there may be an element of a niggling back injury creeping back in, but something else was still a problem. I tried sleeping the other way, which seemed to help. I had also been wanting to try the 11″ mattress again, so I rolled up my 5″ and raided the van to get it. But something still felt wrong. 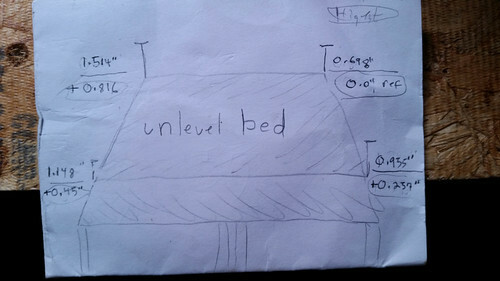 The extra portion of the bed that folds out to make the bed full-sized has adjustable legs for leveling. I still wasn’t able to fully level them with their current length, so I went and re-cut the ends to provide a larger range of motion. With a little twiddling, *that* portion of the bed was level. But it still felt weird to sleep with my head toward the door. 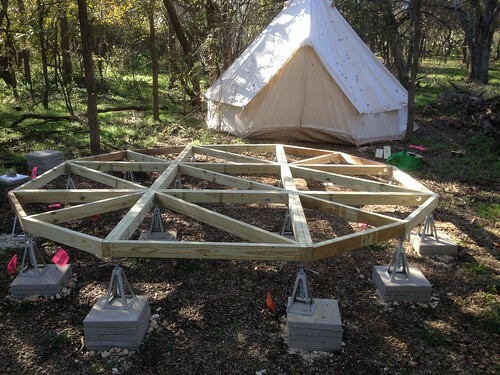 When I made the yurt platform, I used 16 rock-and-block leveled feet and only 2×4 lumber to build it. I didn’t want to put any permanent pilings into my landlord’s ground, and even if I had, I don’t trust them not to settle a bit. I used RV levelers designed to hold 5000 lbs each, so I knew I was wildly over-engineering that part. But when most people build a deck platform, they use 2x6s or 2x8s on concrete pilings sunk into the ground. They would also use solid cross-members that span width of the yurt. Insteadt,my 2×4 frame was designed for maximum portability. It comes apart in about an hour and can be transported with an average mid-sized car. The yurt is also on an incline, with over a 12″ difference from back to front. One reason my rent is so cheap is that I’m using land that would otherwise be harder to build on. All this adds up to a certainty that, at some point, I would need to re-level the yurt. I put the RV levelers as close to vertical center as possible to allow for maximum wiggle room. As long as none of them bottoms out, it’s easy to simply screw them up or down using a level to get the platform itself level. 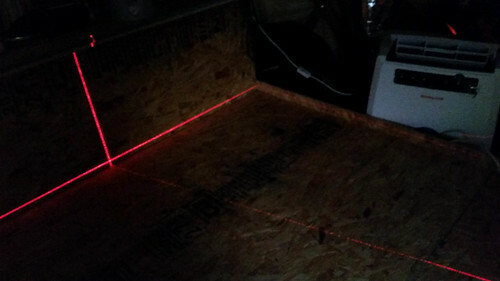 To do this I knew I would need a laser level, which I’ve now purchased. …it means the floor isn’t level. 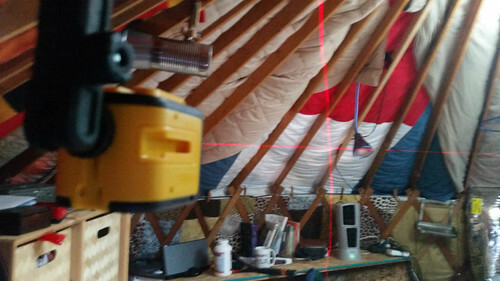 So the solution is to use the laser level to make a plane under the yurt, parts of which are too close to the ground to crawl under, and re-adjust the RV levelers so the platform is level again. 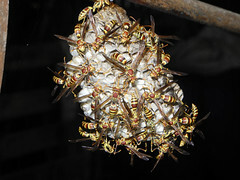 It shouldn’t be too difficult, but it will probably be messy, time-consuming, and mosquito-infested. I knew when I chose this design this day would come, and if I only have to do it every year or two, it’s worth the price of the simple setup and ability to move on without violated the land underneath. This entry was posted in Uncategorized and tagged deck, glamping, leveling, minimalism, platform, rv, simple living, tiny house, yurt. Bookmark the permalink.